Skype for Business shows taskbar notifications and alerts in several situations—like when someone initiates a conversation with you, or when someone adds you to their Contacts list. Skype for Business lets you decide when, where, and from whom you will see these alerts. To set your preferences for receiving notifications and alerts, in the Skype for Business main window, click the Options button , and then select Alerts. A co-worker initiates an IM conversation with you. Your presence status is set to Available. Click Accept to join the conversation. Click Ignore to not join the conversation. You will receive “Sender sent you a message in Skype for Business” or “Missed conversation with Sender” email if more than one message was sent. If you do not click either option, after 30 seconds the message opens. If it is not viewed, you will receive “Sender sent you a message in Skype for Business” or “Missed conversation with Sender” email if more than one message was sent. Note: If you choose to respond to a conversation at a later time after you've missed it, you will receive the conversation in an email message. Your presence status is automatically set to Busy or Away. Your presence status is manually set to Busy or Away. Your presence status is set to In a Call, In a Meeting, or In a Conference Call. Your presence status is set to Do Not Disturb or Presenting (if on PC). Presenting behavior shows as Do Not Disturb unless you have changed the setting. Presenting status is not available on a mobile device. You do not receive a notification. You will receive “Sender sent you a message in Skype for Business” or “Missed conversation with Sender” email if more than one message was sent. Note: If you already have a conversation open with someone who sends you another message while your status is still set to Do Not Disturb or Presenting, the Skype for Business icon on the taskbar will be highlighted. Your presence status is set to Offline. Your co-worker will see “Recipient is offline, but they’ll still get your IMs as missed messages." You will receive “Sender sent you a message in Skype for Business while you were offline” email. Note: If the co-worker accepts the notification on mobile and wants to continue conversation on a PC, the co-worker must create a new conversation on the PC with you, but for you, conversation continues on the PC. If you do not click either option, after 30 seconds the message opens on a PC, and appears as read on mobile. If it is not viewed on the PC, you will receive “Sender sent you a message in Skype for Business” or “Missed conversation with Sender” email if more than one message was sent. Click Accept to join the conversation, and your status will be set to Active. Notification is sent in the IM if Server Side Conversation History is not enabled. If Server Side Conversation History is enabled, connectivity might be interrupted. Your admin might need to open a support ticket. Session timeout: 10-minute timeout that results in multiple chats for the same contact. For IM conversations in Skype for Business on Mac, the timeout period is 10 minutes. This will be fixed in a future update of Skype for Business on Mac. Delivery of messages when several endpoints are logged in. All active endpoints will receive the invitation when initiated. The first endpoint to accept the incoming message cancels the other requests. 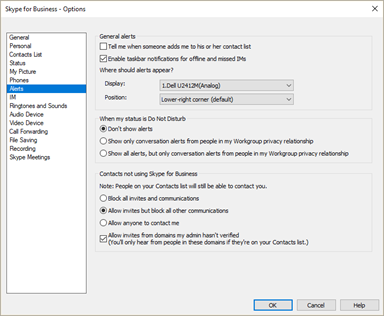 Change alert settings in the Skype for Business main window (Options > Alerts). Choose where you want alerts to show up on your screen. Allow for IMs from workgroup when status is Presenting or Do Not Disturb.